Good morning and welcome to my blog! Today is a very special day for me as it's my first post as a Designer for Heartfelt Creations! I am beyond honored and so very blessed to be a part of this great company and this amazing team. Today I created a large pop-up box card for you from the absolutely beautiful Tropical Paradise Collection. I hope you like it! Other: Memento Dye Ink Pad Dandelion, Zig Clean Color Real Brush Markers set of 48, Kuratake Water Brush, Pink Glitter Cardstock, White Glitter Cardstock, Pearl White 12 x 12 Metallic Cardstock, Quickie Glue Pen, Big Shot, Magnetic Platform, Paper Trimmer, Misti, Hot Glue Gun, Water Spritzer and Sparkle Shimmer Spritz. Create a Pop-Up Box Card. I used the basic instructions from this Splitcoaststampers tutorial. http://www.splitcoaststampers.com/resources/tutorials/popupboxcard/ and then created one that is 8" x 10" when closed. Score a 6"x 12" piece of White Pearl Metallic Cardstock on the long side at 1", 3", 9" and 11". Turn and score at 2 1/2" on the short side. This will form the front and the sides of the card and the flaps to add a 6" x 6" White Pearl panel for the back. Cut another piece of White Pearl 6" x 8" and cover the entire front and 2 1/2" of the top back with Pink glitter cardstock. round the top corners and attach to the 6" x 6" panel. Cut two pieces of cardstock 1" x 7" and score at 1/2" on both ends for the inserts. Cut the Tropical Paradise 6"x 6" paper panels as follows: 1 - 5 7/8" x 5 7/8", 4 - 2 3/8" x 1 7/8", 2 - 3 3/8" x 1 7/8", 2 - 5 7/8" x 3 3/8". Ink all of the edges with Teal Zeal. Follow the instructions in the tutorial to assemble the card making the adjustment for the back panel. Using the white pearl cardstock, cut out the Eyelet Oval and then just the center oval twice using pink glitter cardstock. Adhere to the top of the card as shown. Stamp one set of the Plumeria flowers in Teal Zeal and color with the Teal Zeal and New Sprout inks using the Stack and Store Daubers. Stamp another set in Berrylicious and color with the Berrylicious and Canteloupe inks. Stamp a third set with Paris Dusk and color with the Paris Dusk and Dandelion inks. Cut them out with the Plumeria Die, spritz with water and shape using the the Deluxe Flower shaping kit and the glue gun. Add Prills to the flower centers. Stamp all the birds and leaves with Memento Tuxedo Black Ink and color using the Zig Clean Color Real Brush Markers. Cut them out with the dies and spritz and shape them. Spray them with the Shimmer Spritz. 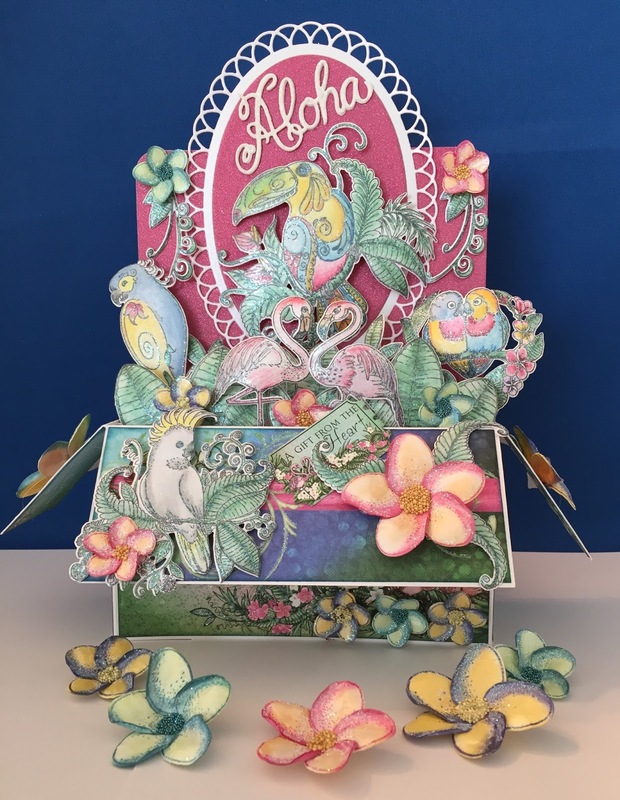 Cut out the Aloha three times...twice with white cardstock and once with white glitter cardstock and using Dries Clear glue attach them one on top of the other for dimension. Cut strips of Clear cardstock, attach to the birds and then attach to the inserts. Adhere the toucan to the oval using double Dots. Decorate the card as shown and add lots of glitter. Add the 5 7/8" x 5 7/8" panel to the back of the card. Cut another piece of the same paper using the Fleur Border Basics Die to form a pocket. Using the Luggage and Tags Die cut out a tag and the A Gift from the Heart ticket from the paper collection. Cut an additional tag from white cardstock. Add the ticket to the front of the card. Adhere the Tropical Paradise tag to the white tag. Add a piece of ribbon to the tag and then place the tag in the back pocket. Cut the Thank You for Always Being There for Me strip from the paper pad, ink the edges and adhere to the back. Thank you so much for stopping by and have a beautiful day! Jaw dropping, eye popping gorgeous!!!! A warm welcome to the team Heartfelt. It would be fun creating together. The project is Stunning....loved it all!! Amazing project, Jan! What a gorgeous piece of eye candy to start off your adventures with Heartfelt Creations! Welcome to the team! This is one gorgeous creation! Well done girl! This is so beautiful! Love it!! How very exciting to see your very first "official" HC Design Team post. You hit a home run here, my friend. Every detail is just perfection. I especially love the little tag you tucked in on the back side. So happy for you! Enjoy the ride! Hugs!